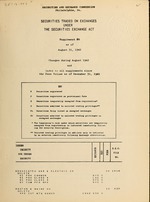 ﻿ Securities traded on exchanges under the Securities Exchange Act as of ..
Securities traded on exchanges under the Securities Exchange Act as of .. Kept up to date by monthly supplements. by an asterisk immediately following Exchange abbreviation. UNION TRUST COMPANY LIrO ol.